One of my favorite, favorite Thanksgiving side dishes is Cranberry Sauce. Oh my gosh, I could just eat a whole bowl of it. It is simply delish and it’s so easy to make, so put the canned stuff back and make your own. I’ll be honest, I never had canned cranberry sauce. I’ve had it at the table, but couldn’t stomach myself to try it. It looks like dark purple jelly. Yuck! Just not my thing, but my Husband loves it. He likes it better than homemade. I think he’s weird, but to each are own, I guess. But today, my cranberry recipe will please everyone. It is my Cranberry Cherry Bourbon Vanilla Sauce. 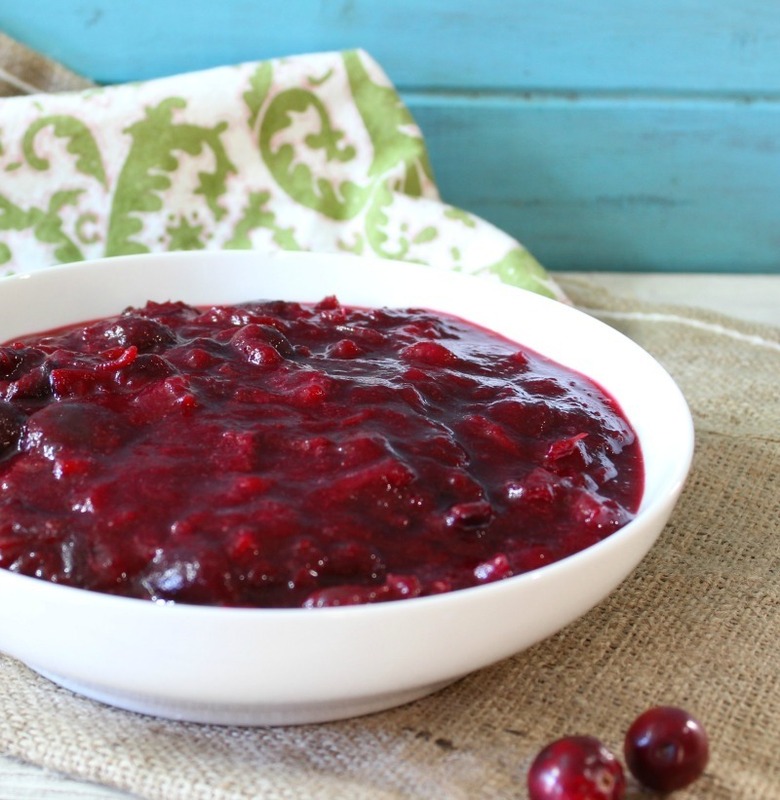 This cranberry sauce has it all! It is slightly tart with a hint of sweetness with juicy plumps of fresh cranberries and cherries with an amazing aroma of vanilla and a slight hint of smokey bourbon. This sauce is so darn good. I have to admit, the vanilla stirred in at the end is the key. You get that amazing whiff of vanilla with every bite. The longer it sits the more vanilla flavor infuses in the sauce. Ah-maz-ing. The sauce takes about 20 minutes to make total, including prep time. It can also be made 3 days in advance so you don’t have to worry about making it on the day of your holiday. Just refrigerate it and when you are ready to serve it, bring it to room temperature. I would say if you can, make it at least one day in advance so the flavors have a chance to merry together. I decided on adding bourbon to the recipe because I wanted something with a little zing, plus I like the slight smokey flavor bourbon has. Oh and cherries and bourbon are like best friends. Have you ever soaked cherries in bourbon? It is called a Cherry Bomb. It is crazy good, but my gosh, you can get a pretty good buzz off of that. 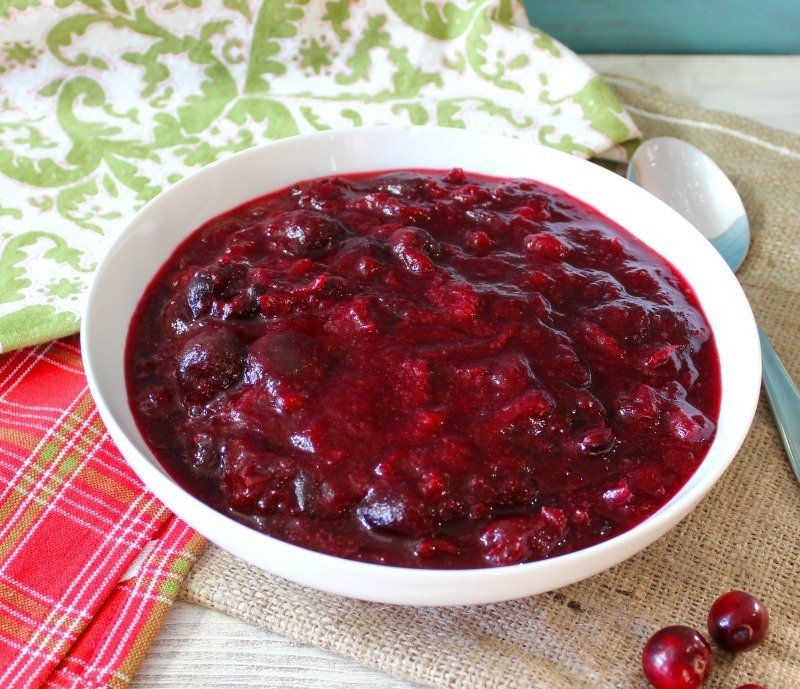 A sweet, yet tart cranberry sauce made with fresh cranberries, cherries and apple juice with the aroma of vanilla with hint of smokey bourbon. 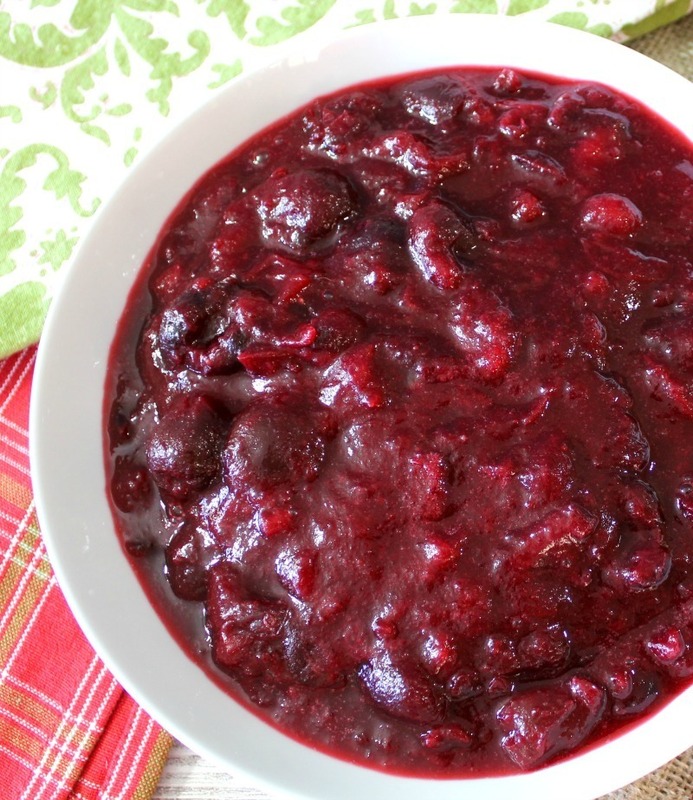 In a medium sauce pan add cranberries, cherries, apple juice and sugar. Bring to a boil, lower the heat and simmer for 10 - 12 minutes, until the cranberries pop and the sauce thickens up. Be sure to stir occasionally. Take off the burner and stir in vanilla extract, then stir in bourbon. Can be made for up to 3 days in advance. 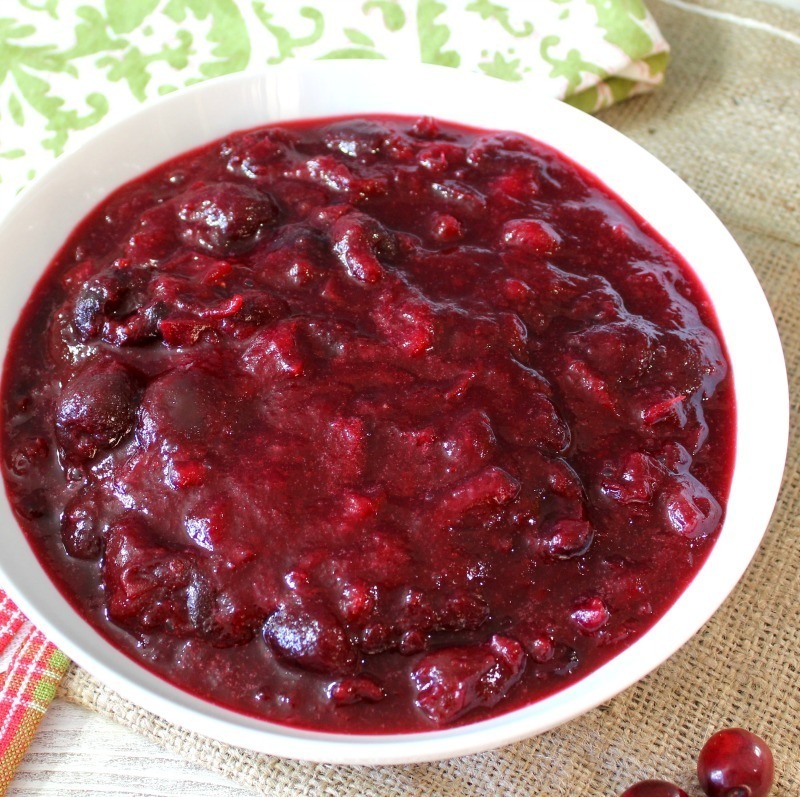 I hope you enjoy this cranberry sauce as much as I do. It’s so good. Glad I have leftovers. Looks very delicious.It is one my favorite thanksgiving dishes.It is very to cook also.Can’t wait any longer to have it more. Thank you. It is one of my favorites too. 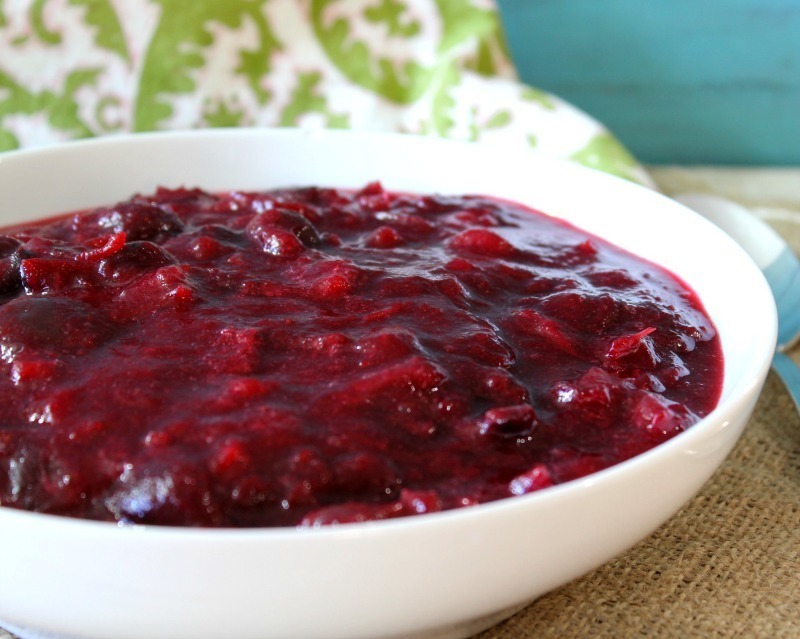 Love cranberry sauce.